This article describes the process for posting an article to Joomla by first pasting the text into the Article Manager, Article Edit Workspace, then re-inserting images stored in folders in your Media Manager. In this article, we will cover the last two steps of the 5 steps for creating and posting articles. We will post the text only version of the article with the Article Manager. We will then use the JCE Editor Image Manager to add the images back to the article. 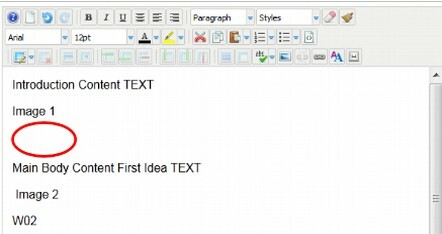 Open up Article Manager – Edit and post your article (copy and paste the text) into the Editor workspace with the JCE Editor. 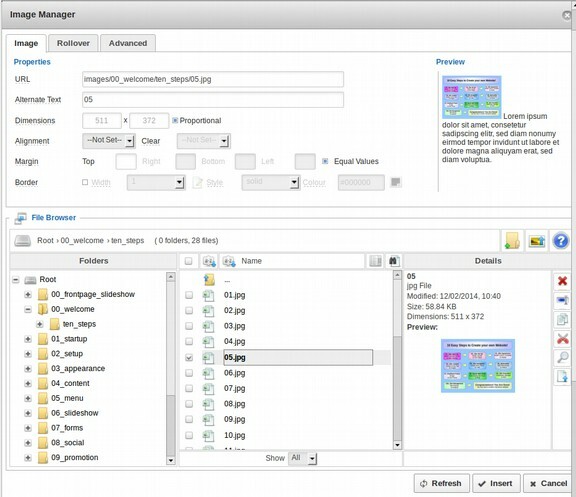 Then reinsert the images back into the workspace one by one with the JCE Editor Image Manager. Then save your new article. Now that all of our images have been loaded to the images/category/article folder on our website’s Media Manager, we are ready to post our Welcome article on our website with our website’s Article Manager. Log into the Control Panel. Then click on the Content, Article Manager. 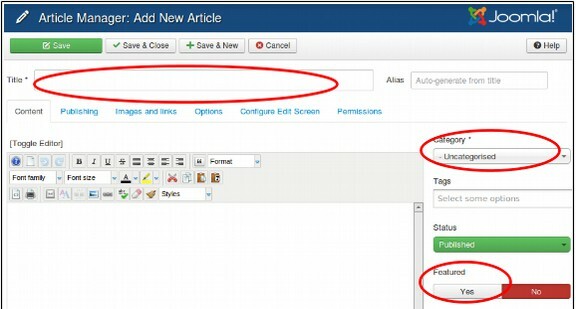 If you installed Joomla without the sample content, there are no articles currently in the Article Manager. We will now add our Welcome article. Click on the big green NEW button. This will take you to the Add New Article page. Select the article which begins with W00. This is the TEXT ONLY version of your Welcome article. 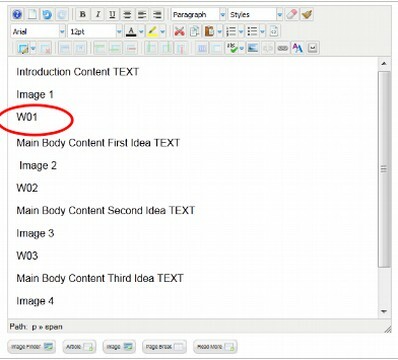 It is important that articles pasted in Joomla have no images, only text. Open and copy this article into your clipboard. 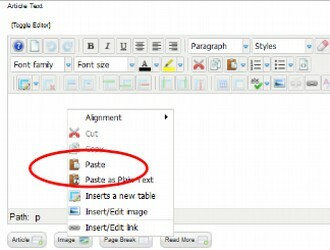 Then, put your cursor in this Joomla Article Window and right click on Paste. This brings up the JCE Editor Paste window. Put your cursor in this window and press Control +V on your home computer keyboard. This will paste the text into the Window. 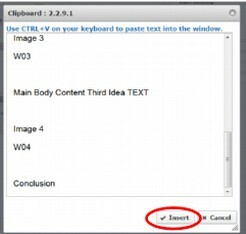 Then click on INSERT to paste the text into the workspace. TIP: To expand the workspace, drag out the triangle at the lower right corner of the workspace. Save the Text Only Version of your Article. After the text is in, but before adding images, it is a good idea to click SAVE. This is because only a limited about of information can be transmitted to the server with any given request. Now that we have posted our article into the Article Manager, it is time to insert the images back in. The next step will be to add back in all of the images which are now in the images/00frontpage/01welcome folder. Delete the Image Placeholder Text. Before we transfer the W01 image back to our web article, we need to first delete the placeholder text W01, leaving our cursor where this image placeholder was. Click on the 00welcome images folder to open it. Click on the Image you want to insert to select it. Our Welcome Article has four images. Select the first one (W01). Click on INSERT. This will place the image in the correct place inside the article. If your web browser is giving you trouble by putting the article somewhere it does not belong, try switching browsers. 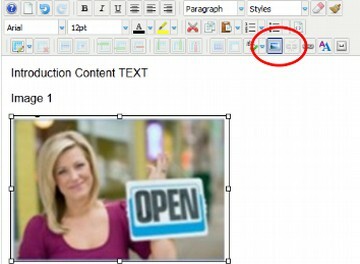 If you want to insert images faster – without always navigating through images folders, or if you merely want to change the size or position of the image, click on the JCE Picture Icon in the bottom row of the JCE Editor. You can quickly locate and select images. Then click Insert. You can format the size and alignment of the image if you want to make it bigger or smaller. Increase the size of the image by entering 400 in the Dimensions box. Type Open for Business in the alternate text box. And select Align Left for the Alignment box. Then click UPDATE to return to the Article Edit Screen. Delete the extra spaces between images and paragraphs. The JCE paste function has a tendency to insert a lot of hidden line breaks in documents which get pasted into your website article. These should all be deleted as you scroll down the page adding your images. Repeat the above steps for the remaining images in your article. 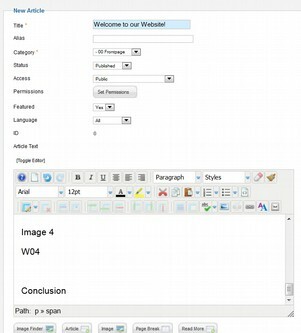 Then scroll down the Welcome article to the w02 text, delete it and insert the w02 image. Repeat for the remaining images if there are more of them. TIP: Only add 10 images at a time. If you have more than images, add 10 then click on the SAVE button, then add 10 more. Then click on SAVE. Then click on VIEW SITE to see how the Front page looks. When it is looking the way you want, click on SAVE and CLOSE. Repeat this process of pasting in the text only version and then adding back images for every article. Now that we have posted our article with its images, we need to create the category structure for our main menu and then create a menu item for our article in the main menu. Those subjects are both covered in the next chapter.